Haag-Streit UK, the leading manufacturer and distributor of gold-standard optometry and ophthalmic equipment, is delighted to announce the Haag-Streit Academy key education course dates for 2019. The newly-formed Haag-Streit Academy delivers an educational programme which sets the highest standards in the optical industry. It has developed a comprehensive range of learning tools and is delighted to confirm an extensive 2019 calendar of CPD-accredited interactive courses, which will be hosted UK-wide. The wide range of events includes the; well-established 'Improving Outcomes' biometry courses, popular 'Premier Slit Lamp Imaging' courses, Advanced Ultrasound Courses and the new 'Gold-Standard Perimetry' Courses. Grant Duncan, HS-UK Clinical Training Manager, said, "We are very pleased to have finalised an exciting programme of educational courses for 2019. 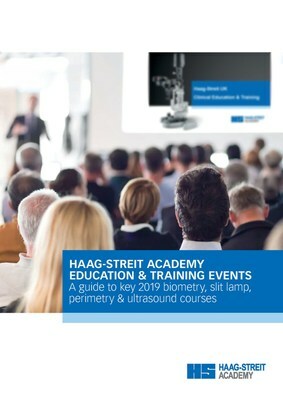 I hope that our customers find the Haag-Streit Academy brochure and event calendar a useful addition to their notice board and that we will be able to help fulfil their training requirements during the coming year."